The Forestry and Forest Products (ffp) Research Centre of the Council for Scientific and Industrial Research (CSIR) and the University of KwaZulu-Natal have collaborated on numerous joint research projects with two of the major commercial forestry companies in South Africa viz. Sappi Forests and Mondi South Africa to evaluate the effects of site quality and various environmental factors on wood and pulp properties of Eucalyptus spp. This research has contributed to understanding how age, site, environmental and genetic variables impact upon the quality of end products produced. A rapid screening approach that allows non-destructive assessment of variation in wood quality among forest resources in a quick, reliable and cost-effective manner was a product of this collaboration. In parallel with these tools, FFP also carries out conventional analysis of wood for the pulp and paper industry using digesters, handsheet production and pulp testing. Tree stems are drilled at breast height to obtain radial (pith-to-bark) cores, and these are sawn into strips. Radial strips, of uniform thickness, are cut along the radius using a twin-blade saw. 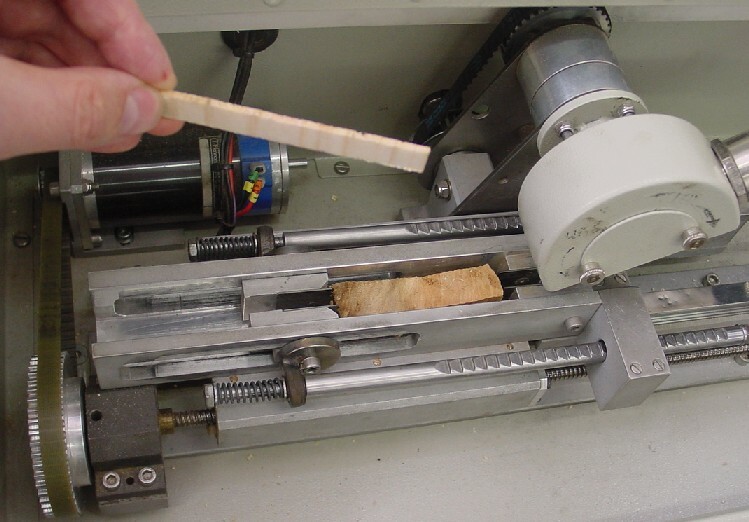 Radial wood strips are later used to measure density, anatomical properties and wood chemical properties. Wood density provides a reliable measure of the amount of cell wall material present in wood, and is a strong indicator of many strength properties of paper. 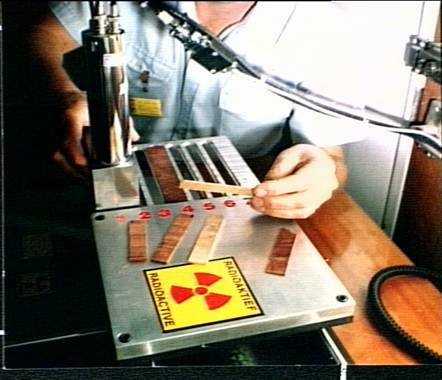 Wooden strips are scanned along the radius using an automated gamma-ray densitometer designed at the CSIR. The output is a profile from pith to bark that reveals variation in density within the tree. Fully-automated microscopy and image analysis systems allow accurate and efficient capturing of anatomical data. 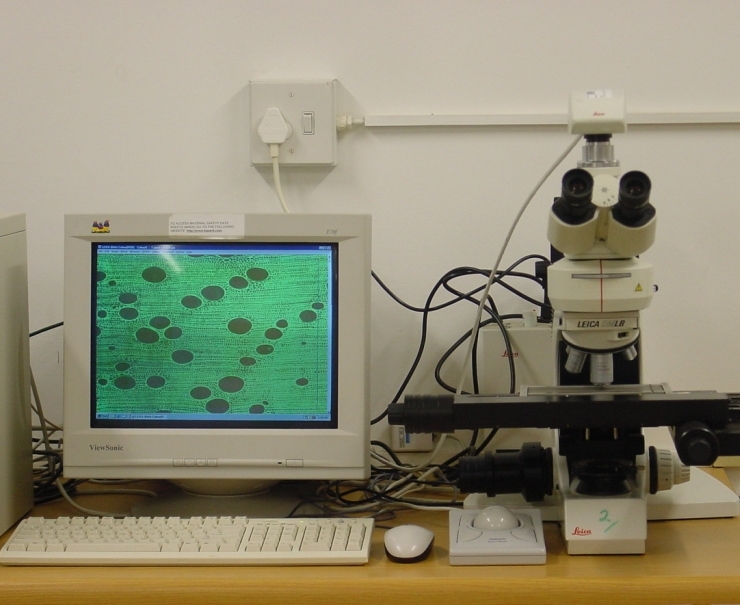 Features such as cell wall thickness, fibre diameters and vessel properties are identified and measured through computer-assisted processing. Data are continuously exported to a spreadsheet, ready for analysis. The accuracy and reliability of anatomical measurements is verified by the close relationship between cell wall thickness measured using microscopy, and the density profile acquired by gamma-ray densitometry. Pulp yield is an important issue in the pulp and paper industry. Traditionally, the pulp yield of a compartment has been determined using laboratory digesters to process chips from selected compartments. This method is time-consuming and labour-intensive, and therefore impractical for characterising large numbers of compartments. The introduction of near-infrared (NIR) technologies into pulping studies has made it possible to predict pulp yield with a level of precision comparable to that of laboratory digesters. 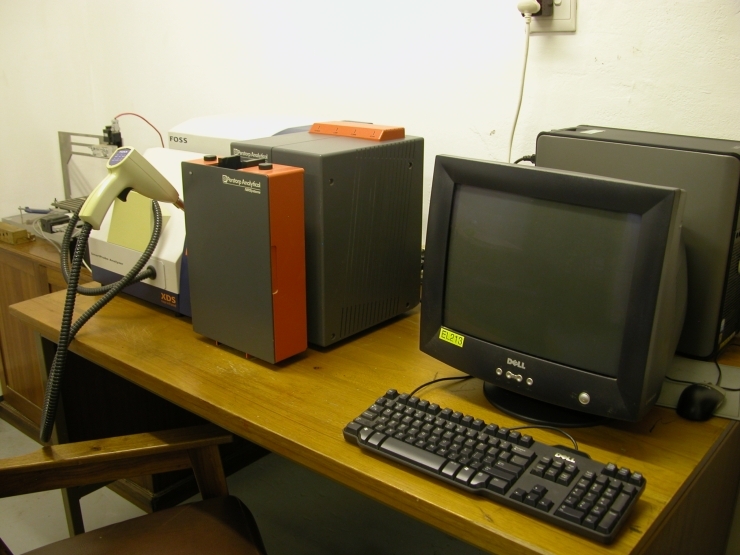 Spectra obtained from the reflection of near-infrared radiation from either sawdust or solid wood samples can be calibrated against laboratory-determined measurements of pulp yield, lignin, hemicelluloses, cellulose, etc. Models developed based on this approach allow prediction of pulp yield and the relative amounts of wood components to be determined without need for additional laboratory analyses. ffp ’s chemistry laboratory is equipped to measure the chemical composition of different wood species for components such as cellulose, lignin, hemicellulose and extractives content. For more information about basic wood properties, please contact Viren Chunilall .